Whether you treat your maladies with an herbal tea or a pill from the drugstore, your medicine probably got its start in the garden. At the kick-off event for the medicinal gardens at the Buffalo and Erie County Botanical Gardens Wednesday, a proponent of herbal medicine and pharmacists from D’Youville College gave their views on healing plants. Yolanda Smith, left, a member of the Seneca Nation of Indians, is a medicine gatherer and talked about the use of herbal medicines. Smith recommends eating whole foods and organic foods without preservatives. “Stay out of the can, stay out of the box,” she said. 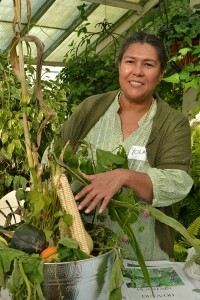 When she talks about healing plants, Smith starts with the “three sisters”: corn, beans and squash. They’re full of vitamins and other nutrients, and “They sustain our life,” she said. Corn silk can also be used to make a tea to clean the bladder, she said. A drawing salve (used, for example, to draw out a sliver), can be made from a mixture of yarrow, St. John’s wort and plantain, she said. Plantain is a plant that most of us think of as a weed in our lawns. She uses a tea of white pine needles for colds and fever. In the spring, a number of plants provide ingredients for tonics: maple sap, sassafras, wild onions and leeks. Her mentor taught her to look for plants with the characteristics of the body part you want to affect. Smith believes that the wild strawberry plant, with its red, heart-shaped fruit, is good for the heart. She looks to the dandelion, which has a flower the same color as bile, for remedies for the liver. 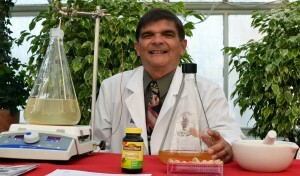 Robert K. Drobitch, Ph.D., professor and chair of the Department of Pharmaceutical, Social and Administrative Sciences at D’Youville College, is just as appreciative of the medicinal properties of plants. “Our comfort zone is prescription medications,” he said. Drobitch has done research that appears to show that ginseng can prevent Parkinson’s disease in rats. People assume that because a substance is “natural,” it is always safe, but that’s not the case, he said. Just as some foods can interact with prescription drugs, herbal remedies can have negative interactions with prescription drugs. He recommends that you tell your healthcare provider about any herbal remedies or supplements you use. He also warned that the potency of herbal products can vary, whether you’re buying herbal products in a store or growing them yourself. “The active ingredient of natural products vary according the soil conditions and time of year it is harvested,” Drobitch said. Since the potency of a botanical product may vary from one company to another, he suggested that if you find a natural product that works for you, stick with that brand. “Don’t be swayed by the sale of the week,” he said. Even if you grow the medicinal plant in your own garden, it’s important to tell your healthcare provider, he said. Next week: Learn about common plants that are poisonous. This was a great review of a wonderful event, Connie. I too was most impressed with Yolanda. I talked with Robert too, and found him very informative and interesting. I thanked them both for taking the time to come for the event and enlighten those of us in attendance who greatly enjoyed their presentations. There was so much information that I couldn’t fit it all into one issue of the magazine! I plan to have the video with Rachel Gorodetsky discussing poisonous plants in next week’s issue.